Construction Details Print of our Lean-to Sheds. Note: To improve our buildings, we reserve the right to change construction details without notice. 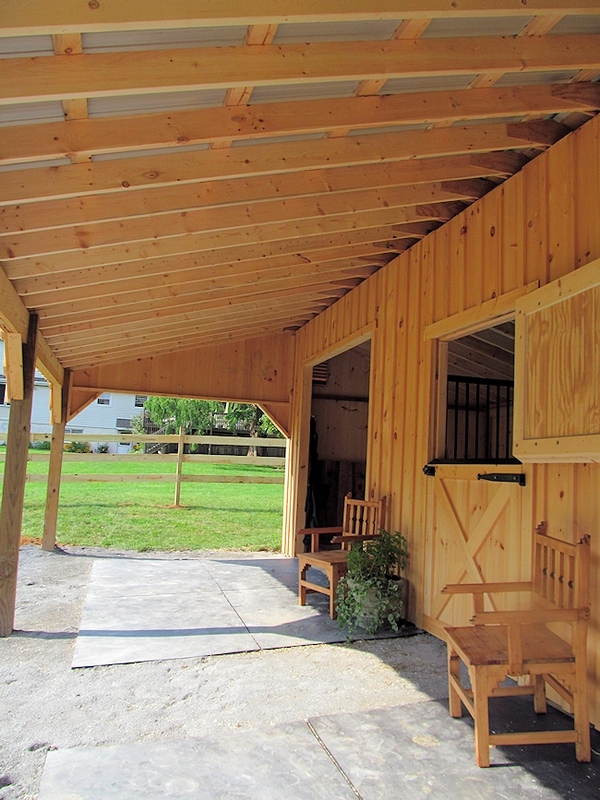 Please ask us for up-to-date specifications when ordering your barn. We willl supply CAD drawings when leanto barn is ordered. To comply with code requirements in some select areas, we might substitute oak posts with Yellow Pine posts. 12' wide lean-to barn before overhang is attached. Lean-to overhang must be assembled on site. Overhang comes partially pre-built with gables already built. View from underneath the lean-to. We use 6x6 p.t. posts and double 2x10 header to support overhang. This barn was built with optional metal roofing. It is strongly recommended to place lean-to barns on top of concrete foundation (concrete pillars). 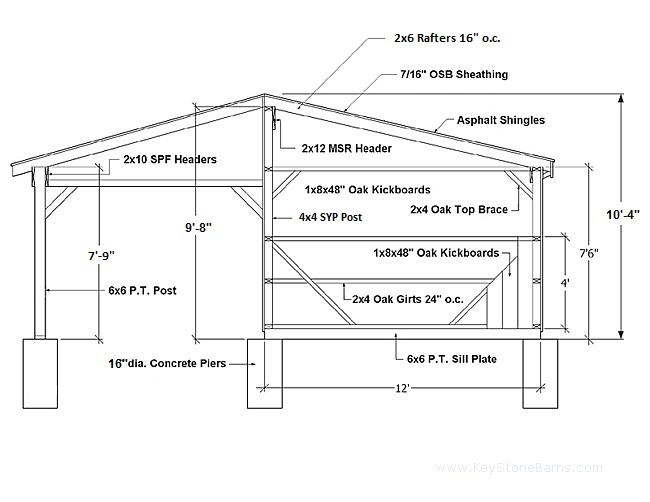 With every lean-to barn order, we email free PDF plans. Plans we supply are floor plan, gable detail and foundation layout (plans are not sealed). Exact lean-to overhang dimension is not true 8' or 10' in width. Exact width is specified on plans. On all lean-to barns, front wall is made taller to accommodate overhang and create more clearance under overhang header. 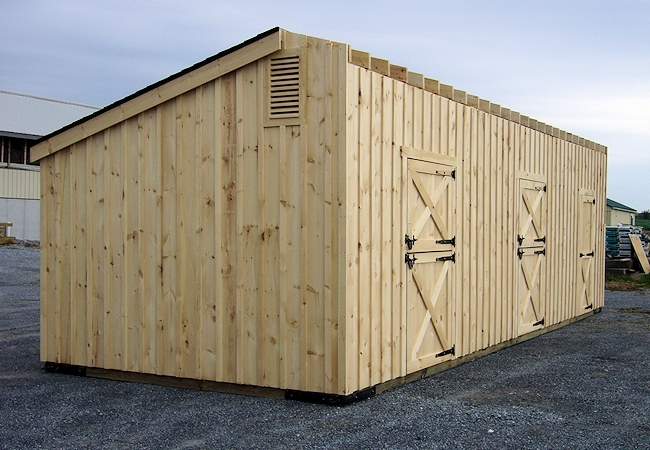 Regular shedrows or run-in sheds are not designed for future lean-to addition due to front wall not being tall enough on standard barns and sheds. Depending on your local ground snow load, we might need to upgrade rafters to 2x8 SPF in order to comply with codes (extra fee will apply). You may choose to place overhang 6x6 p.t. posts in the ground or on top of concrete pillars (in ground placement is less expensive). You must specify if you are planning to put overhang posts in ground or on foundation, so we can send you the right length posts.